Beloved, Christ is in our midst! On behalf of the dedicated parishioners of St. Gregory American Coptic Orthodox Church, I welcome you to our parish website. Soon, I hope to welcome you to one of our many services. From Divine Liturgies in which we worship the Holy Trinity and realize our potential as the Body of Christ to community service events in which we serve Christ in the people around us, there is something for everyone. In the meantime, I invite you to look around and benefit from the resources we offer. When you’re ready to schedule a visit or a more in-depth meeting, remember that there is always a place for you at St. Gregory. We believe that God is one in Essence and Trinity in Persons (i.e., the one true God has appeared to us as Father, Son, and Holy Spirit). The Father, Son, and Holy Spirit is the Trinity, one in Essence and indivisible. The Father is not born and does not proceed from the others. The Son pre-eternally was born of the Father, and the Holy Spirit eternally proceeds from the Father. We believe that all the Persons of the Holy Trinity are equally in divine perfection, greatness, power, and glory. That is, we believe that the Father is true and perfect God, the Son is true and perfect God, and, the Holy Spirit is true and perfect God. Therefore, in prayers, we simultaneously glorify the Father, the Son, and the Holy Spirit as one God. The tra­di­tional pos­ture for prayer and wor­ship in the Ortho­dox Church is to stand, as before the King of the uni­verse! In many churches in Egypt, there are typ­i­cally no pews in the churches. Chairs or benches on the side walls are usu­ally reserved for the elderly and infirm. In Amer­ica, we build our churches with pews or chairs, so you may sit. How­ever, it is appro­pri­ate to stand dur­ing the Gospel read­ing, the Anaphora through the Insti­tu­tion Nar­ra­tive, the dis­tri­b­u­tion of the Holy Mys­tery, when the priest gives a bless­ing, and at the Dismissal. Light­ing can­dles is an impor­tant part of Ortho­dox wor­ship and piety. We light can­dles as we pray, mak­ing an offer­ing to accom­pany our prayers. Ortho­dox typ­i­cally light can­dles when com­ing into the church, but there are times when can­dles should not be lit. Can­dles should not be lit dur­ing the Epis­tle or Gospel read­ings, and dur­ing the ser­mon. You do not have to be an Ortho­dox Chris­t­ian to light a can­dle and pray! Between 65–75% of the tra­di­tional Cop­tic Liturgy involves con­gre­ga­tional singing. Cop­tic Chris­tians do not use musi­cal instru­ments with the excep­tion of the cym­bals and tri­an­gle, which are used sim­ply to keep musi­cal time. A choir of dea­cons leads the con­gre­ga­tion in har­mo­nious chant, usu­ally in Cop­tic and Eng­lish. Our hymns are solemn, prayer­ful and intended to lead the faith­ful to wor­ship the liv­ing God. When you enter a church, some­one will greet you and direct you to a place to sit. We have books of our Divine Liturgy in Eng­lish, Cop­tic, and Ara­bic to every­one. In addi­tion, we have a large Pow­er­point pre­sen­ta­tion that updates con­tin­u­ously dur­ing the Liturgy with the prayers. You may fol­low the ser­vice text, or, if you pre­fer, sim­ply close your eyes and enter into the Church’s beau­ti­ful wor­ship of God. Fol­low­ing the Sun­day Divine Liturgy, you are invited to join us for a “cof­fee hour” which is a good time to get to know our parish mem­bers and meet our priest. Ortho­dox priests may only serve the Holy Eucharist to bap­tized mem­bers in good stand­ing of the canon­i­cal Ortho­dox Church, who have recently con­fessed, and fasted before par­tak­ing of the Holy Eucharist. This is the ancient tra­di­tion of the Holy Church for the 2,000 years of its his­tory. The Ortho­dox Church under­stands the Holy Eucharist as a mys­tery of the real pres­ence of Christ in the Eucharist, not sim­ply as a memo­r­ial, or merely in a spir­i­tual sense, as many other non-Orthodox Chris­tians do. Rather than try­ing to accom­mo­date to often vary­ing “inter­pre­ta­tions” or revi­sions of this and other doc­trines of the ancient faith, we sim­ply ask that you respect the ancient, apos­tolic tra­di­tion and join us in receiv­ing the Eulo­gia (blessed bread), at the end of the Divine Liturgy. On Sat­ur­day evenings, the Evening Rais­ing of Incense ser­vice (Ves­pers) is gen­er­ally 30–45 min­utes in length, includ­ing a short homily in Ara­bic or Eng­lish. 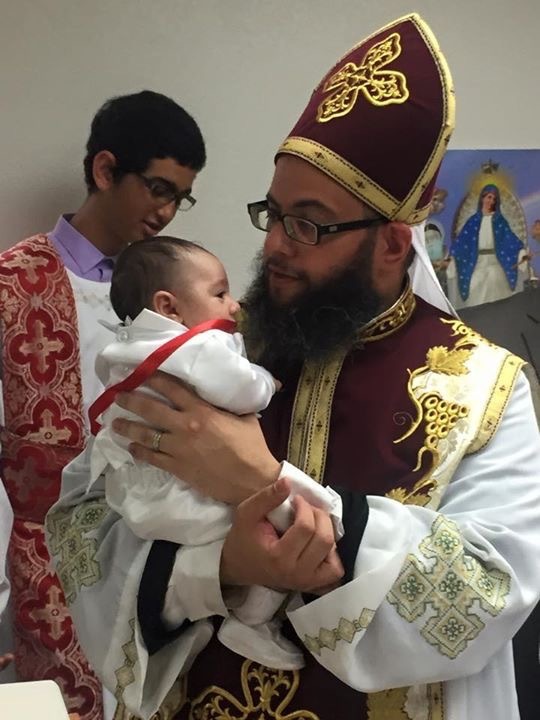 On Sun­day morn­ings, a sim­i­lar ser­vice is cel­e­brated before the Divine Liturgy. After­wards, the Divine Liturgy is approx­i­mately 3 hours in length with an Eng­lish homily at approx­i­mately 9:30 a.m. and the Dis­tri­b­u­tion of the Mys­tery of the Eucharist from 11:00–11:30 a.m. We under­stand this may seem like a very long ser­vice, but we know that when you have par­tic­i­pated in an Ortho­dox ser­vice you will feel like you have truly wor­shipped the liv­ing God. The gen­eral rule for men and women is to dress appro­pri­ately, mod­estly and respect­fully, as before the liv­ing God. We ask that you not wear shorts, mini-skirts, tank tops, low-cut or strap­less dresses (unless cov­ered by a sweater, etc.). Yes, immediately after the Sunday Divine Liturgy, we pro­vide Sun­day school in small groups for chil­dren in grades K through 8, as well as meetings for youth in high school and college. If you would like to learn more about this please contact Fr. Moses.